An so the endless waltz of car roster improvements starts with two old gondola to be bashed as close as possible to Erie prototypes. The idea is not to make exact replica, but to put enough efforts so the models can be credible. I've bought sets of dry transfer from Clover House suitable for Erie 37500 series. These cars were initially built as drop bottom gondolas until they were later rebuilt with fixed floor. While I've been lucky enough to find as built picture of Erie cars, my search for rebuilt car wasn't rewarded by any significant results. For more information, Ronald Dukarm wrote a short but informative story about these cars on railfan.net. For this reason, I ask any reader that can point me decent sources of information about these particular cars to contact me. Many books and publications about Erie cars have been released over the years, but sometimes, it can be quite hard to find out particular prototypes when you have very little information about them except length, road numbers and sparse details. In fact, I'll have to build (or rebuild) many boxcars and gondolas following Erie practices. Thus, I'm quite open to acquire relevant books/magazines on these subjects. However, I'm not that much familiar with Erie and would prefer to purchase books based on educated suggestions. Factual data over nostalgic books would be better. For the boxcars, Don Hanley's excellent series of articles in Model Railroad Hobbyist back in 2013 is an excellent starting point. I certainly would love to have better information on gondolas. You probably know about this already, but in case you don't, a type of Erie gondola is covered in Railway Prototype Cyclopedia Volume 3 - 52'-6" Drop-End De Facto Standard 70-Ton Mill Gondola. They were built between 10-40 and 5-52 of the Greenville design (2,125 cars). Although the article goes into specifics on modelling a Rock Island car, there are six clear pictures of the Erie gondolas along with a listing of road numbers which also includes what grabs/ladders, floor, hand brake, kinds were used. It looks like an easy detailing project - the Life-Like/Walthers model is used as a basis. I'm must admit I'm quite a dilettante in term of Erie rolling stock. My interest only sparked recently and I'll have to get some reference books in following months. 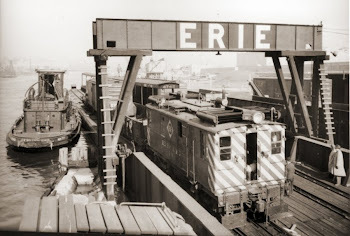 Among other cars, Erie's boxcar fleet is fascinating and I'm glad an article series was published in MRH not so long ago. I'm also sifting through articles written by the late Richard Hendrickson. Interestingly enough, I recall identifying that specific gondola on an old Harlem Station picture last week and adding it to my project list. I've got a few pictures of them, but I agree having more first hand details would pay off. I've got the Life-Like gondola which got replaced with a Rapido earlier this year. As you said, it's a good starting point and I'll try to track down the RPCYC even if the volume is long sold out. I also read somewhere the old Athearn BB 50ft mill gondola could be bashed into a specific NYC car, unfortunately no reference to the prototype was mentioned. Thanks again for your useful suggestions! Meanwhile, back to bashing a pair of Erie 37500 series gondolas! The builder photos I have depicting the gondola are #10575 (blt 11-41) and #11349 (blt 4-46 last digit hard to read). They would fit the built dates you previously mentioned. Unfortunately, it's impossible to see the car ends thus the brake gear and end drop doors type can't be identified. ERIE 10575 was first of the third lot of these cars (blt 11-41). They had grab irons, wood floor, Ajax power hand brake (side mounted). ERIE 11349 was built in the 4th lot in 1-46. Same as above except with Equipco lever brake and Apex brake stand. Weird, it seems my reply was deleted. You can contact me at matlac(at)gmail.com. After doing some researches, I found out Proto 2000 based their gondola on the Erie Greenville-built car, most probably the 10325 order. The paint scheme is identical down to the exact same built date. Also, builder pictures show the same things you described, which are a perfect fit to the L-L car. As it stand, the four different roadnumbers released by Life-Like would be correct.